1) Remove brush head by gently turning counter clockwise. 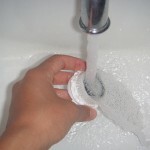 2) Gently rinse brush head in warm water. 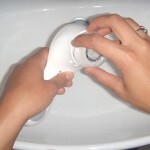 3) Apply anti-bacterial soap to the brush head to clean the bristles. 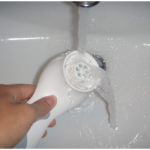 If necessary rinse out the interior of the brush under the sink or shower head. 4) Reattach the brush head to the unit. You are ready to sonic cleanse again! The skin is the largest organ and is vital in protecting our body. That’s why keeping it healthy is of the utmost importance. With November being National Healthy Skin Month, there is never a better time to explore some ways to keep your skin in the best of health all year round. •Determine your skin type (oily, dry, combination, normal or sensitive) then choose appropriate skin care products specifically tailored to that type. • Wash your face every day using a mild, fragrance-free cleanser with lukewarm water. Don’t forget after exercising as well! • Moisturize daily by applying a lotion or cream while your skin is still damp from bathing. This helps to lock in moisture and gets the best results. • Protect your skin from the sun by seeking shade, wearing protective clothing and using a broad-spectrum, water resistant sunscreen with an SPF of 30 or higher. • Examine your skin regularly for suspicious or unusual spots which could be a sign of skin cancer. Keep a lookout for anything changing, itching or bleeding. If you notice anything suspicious on your skin, or if you have a question about skin care, give our office a call today. After watching the Oscars last night, it may seem like celebrity skin is the epitome of perfection, but don’t be fooled, they struggle with the same issues that everyone else does. Whether it’s acne or wrinkles, they are always looking for the latest trends or products to keep their skin looking fantastic. Actress Jennifer Garner is no different. Her secret to keeping her blemishes at bay is the Clarisonic Skin Cleansing System. It improves skin tone, reduces the appearance of pore size, and helps other skin care products work that much better. The Clarisonic Skin Cleansing System utilizes a patented sonic frequency of more than 300 movements per second to clean, soften, and smooth the skin. In just a minute, it removes six times more makeup and twice as much dirt and oil than cleansing with just your hands. Jennifer has reaped the benefits from using Clarisonic, you should too! Call our office today to get yours!